Dinner with the Bay Area Boys! Our first couple nights here in the Bay Area, my Aunt and Uncle invited Boyfriend and I over to their house for dinner. We were lucky to get home cooked meals by doting “parents”! Last night was officially our first dinner out since the move… we met up with Horace, Carlo and Bob for an Italian dinner in Palo Alto. Vero looked innocent enough. Small, quaint, and friendly. It’s unfortunate that everything that could’ve gone wrong at dinner last night, went wrong. 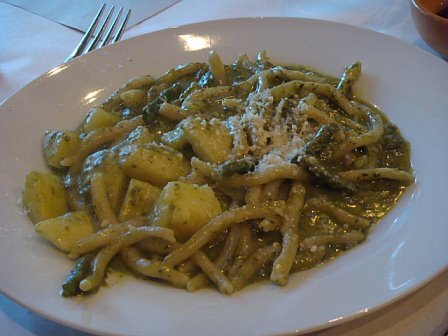 Boyfriend ordered the Trofie alla Genovese: hand rolled pasta, potatoes, string beans and pesto. 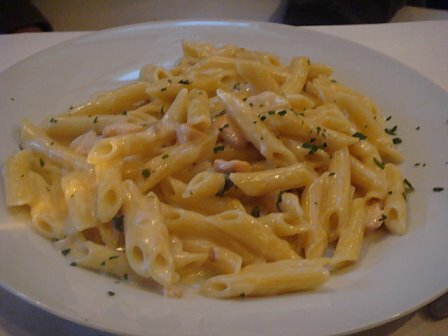 Bob and Carlo both ordered one of the specials: Penne with salmon and cream sauce. 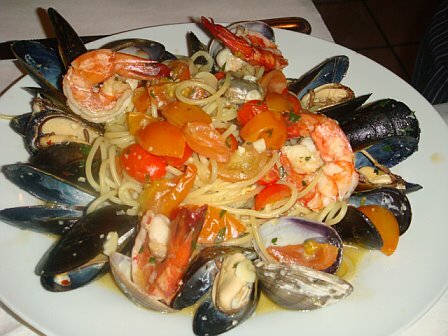 Horace went with a seafood pasta (obviously). 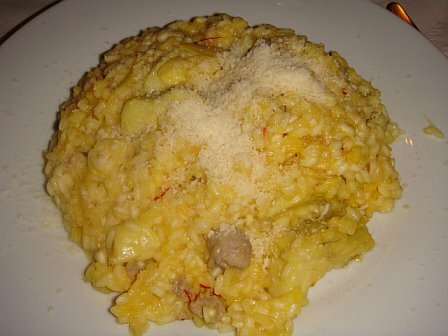 I went with another special… risotto with Italian sausage and porcini mushrooms. The risotto was harder than I prefer and this picture makes it look like I ordered mac n cheese. Our server dropped Horace and my plates onto the floor as she was serving our table so the two of us had to wait extra time for our dishes to come out. When our dishes finally did come out, I noticed my dish had artichokes instead of porcini mushrooms. Porcini mushrooms were the sole reason I wanted to try the risotto. She bad mouthed the chef and mentioned that the sausage and artichoke risotto was last night’s special. Our server comped Horace a glass of white wine and Bob got a free beer. I got hot tea out of the artichoke/mushroom mistake. Neither the tea nor wine were drinks we planned to order on our own. Dessert should’ve been simple enough. Bob ordered the Suffle’ al Cioccolato and Carlo and Horace both went with the orange one. 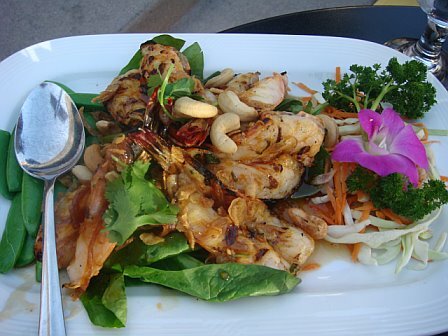 These were noted on the dessert menu to take 10 minutes to prepare. Boyfriend and I got the Panna Cotta with strawberries. After we had waited about fifteen minutes, our server came out to tell us they do not have orange souffles! Unbelievalbe. 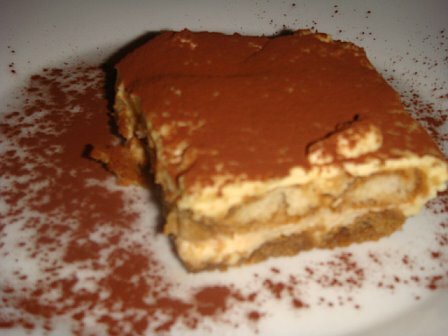 Carlo changed his order to a chocolate one like Bob and Horace ordered a tiramisu. Another ten minutes or so after that, our server came to tell us that they have ONE orange souffle and that they would bring that out. 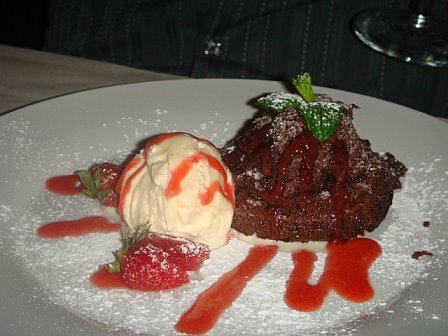 No problem with Bob’s dessert. He said it was really rich and could feel the richness through his eyes! That must’ve been fun at at the gym when he met up with his friend right after dinner. The one orange souffle of the night which Carlo consumed. 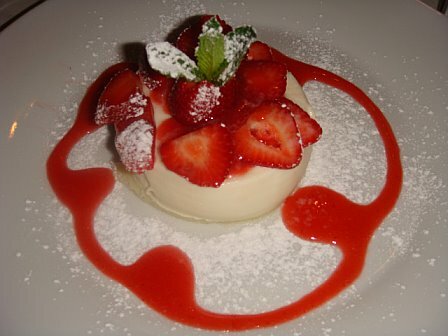 The panna cotta that Boyfriend and I shared. I’m so glad we had great, entertaining company at last night’s dinner. We were there for over two hours most of which was spent waiting. 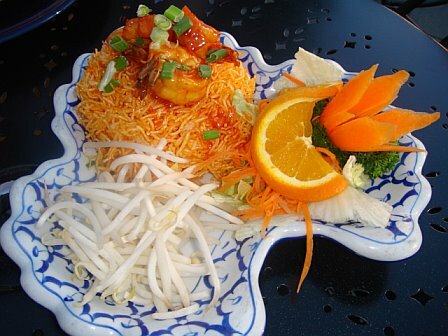 The food was just alright and the experience there was nothing to write home about. (although I apparently thought it was worth blogging about!) In our server’s defense, she was the only one there last night but it wasn’t THAT crowded. Perhaps she was just having a bad night?? I probably won’t go back to Vero although I loved the neighborhood and definitely want to try out other restaurants in the area. we went back to the beginning. We’ve officially moved to NorCal! It’s weird being here and since we are in an extended stay hotel, I still feel like we are on vacation. We ate out almost every night for three or four weeks before we left LA but I had no time to update. One of our final nights in SoCal, we went back to the restaurant where we had our first date. 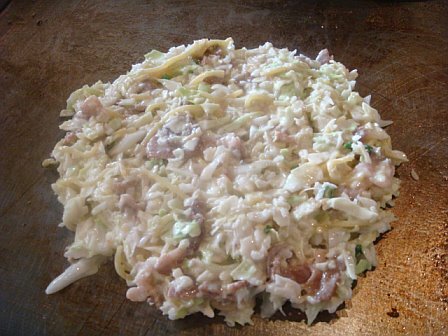 Gaja Okonomiyaki. Boyfriend had never tried okonomiyaki before so he decided to be brave and try it out on our first dinner date together. 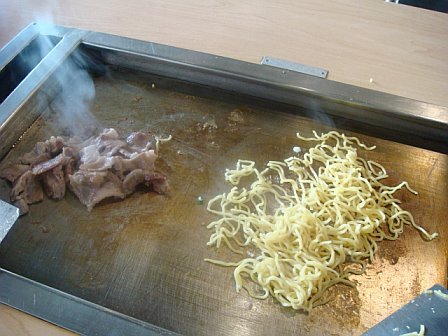 Okonomi means what you like and yaki means grill or cook. So basically, okonomiyaki means grill what you like. 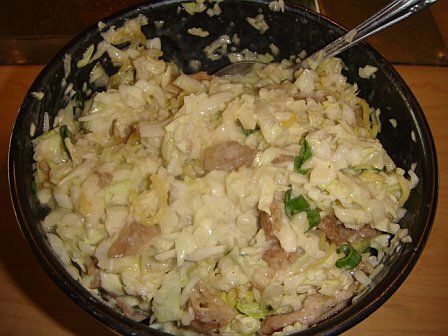 You can put almost anything in this “Japanese pizza” but it usually consists of flour, eggs, shredded cabbage and meat/seafood. We ordered “modan” which consists of pork and noodles. 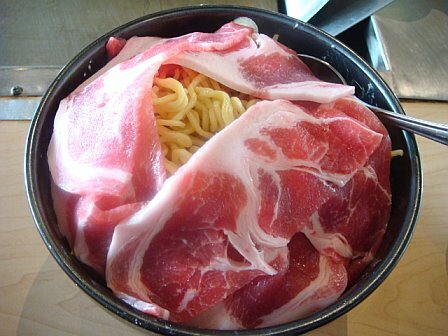 First you cook the meat and noodles separately. Then you place the ingredients onto the grill in the shape of a pizza. We made two “pizzas” from our one bowl. 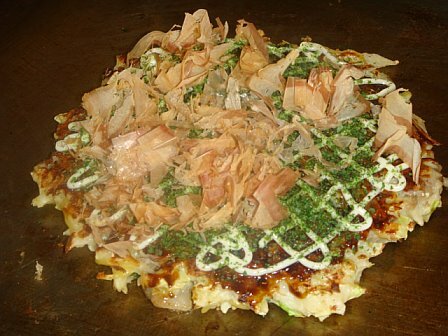 Once it’s cooked on both sides, you usually top your okonomiyaki with sauce, mayo, seaweed and bonito (fish) flakes. Yum! 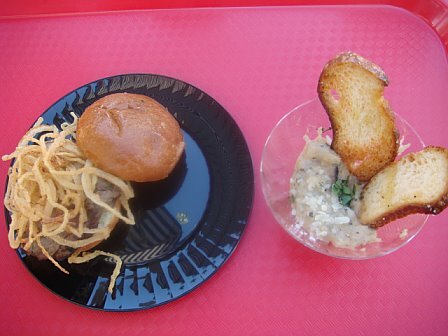 The California Food and Wine Festival is going on at CA Adventure until May 5, 2008! They have special tapa-sized delights being served so we tried a couple as a “snack” since we were there. We got a prime rib slider and mushroom risotto. I *think* both were good but because they were SO SMALL I’m not sure I got a good taste of either. The bun of the slider was smaller than the palm of my hand! If we had more time, I would’ve liked to try a wine tasting or some food and wine pairings. They were definitely cute but I’m not sure they were worth the $8 or $9 bucks for both that Boyfriend paid. 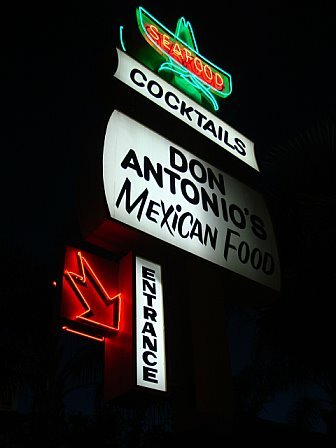 99 cent taco night at Don Antonio’s! I think my headline says it all. 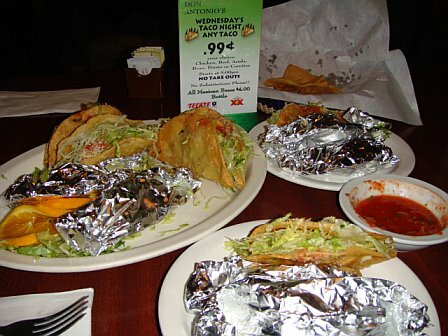 You can choose from chicken, beef, asada, carnitas, potato and bean tacos. It begins at 5 PM every Wednesday night. The earlier you get there, the better because it gets PACKED! I’ll admit… I wasn’t terribly excited about driving out to Melrose again for dinner. (This would be the second time in 3 days.) It just seemed more trouble than it was worth and what does Ashton Kutcher know about food anyways?!? I almost told Boyfriend, “You know what, let’s just stay home for dinner tonight.” I had done five loads of laundry and my body felt like mush by the end of the day. But… I am so—-o glad I kept my mouth shut and that we went!! 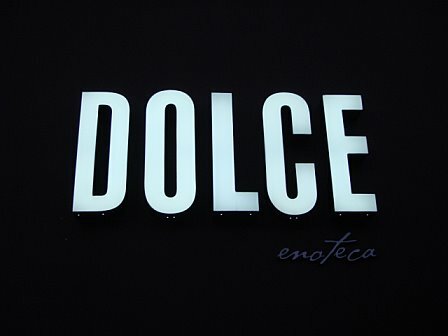 Allen had told me about Dolce a few weeks ago. Everything on their menu is 50% off on Mondays!!! Correction, all the food on their menu is half off on Mondays. Alcohol is regular price but since we went there for the food, we scored! Our reservations were at 6 PM and the place was so deserted it was uncanny. I loved the decor and ambiance as soon as I sat down. The seats were incredibly plush and Boyfriend pointed out the bar to me right away. 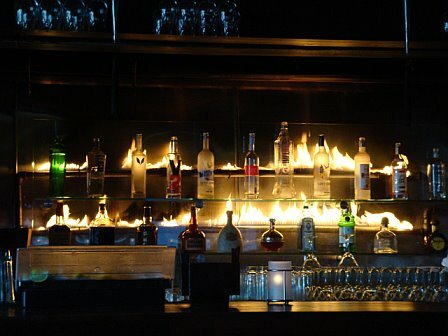 I don’t think the open flame behind the bar served any purpose but it was cool to see. A half hour later and I wouldn’t have been able to get this shot. The bar soon became packed. 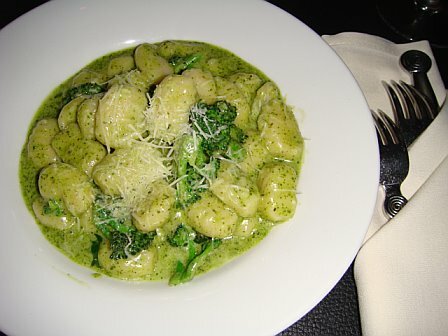 We had two starters, one which was the Pesto Gnocchi. I thought the gnocchi at Village Idiot was good but this was superb! It states “appetizer portion” on the menu but there were plenty for Boyfriend and I to share and at $4.50 (the half off price) it was a steal. 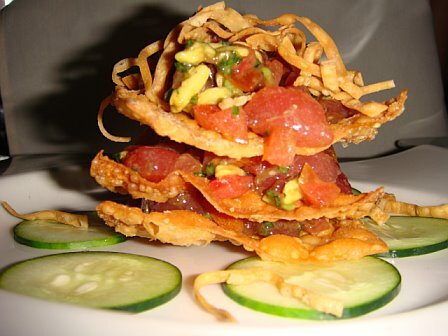 Our other starter was the Tuna Tartare with avocado and tomato stacked on crispy wontons. Boyfriend said it reminded him of poke and although this was good, he likes poke better. 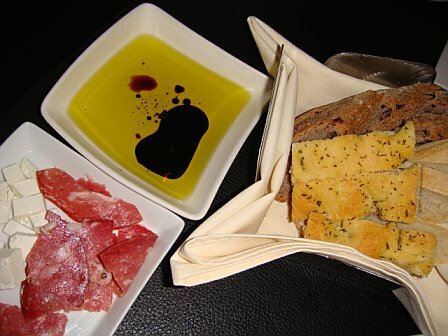 After our starters were brought out, we got bread, cheese and salami. Boyfriend kept eating and eating and eating and eating the bread. I counted 5 pieces! It must’ve been good… or he must’ve been really hungry! Boyfriend went with the NY Steak after our server told us it was one of his favorite dishes. He had just had it the night before for his birthday. 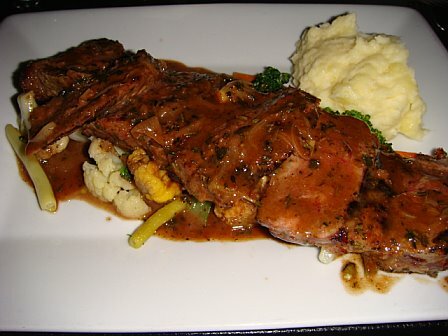 It had a peppercorn sauce and came with mashed potatoes and veggies. I learned what osso bucco means – since I didn’t know back in Carmel – (slow cooked) and went with Dolce’s signature dish: Milanese. 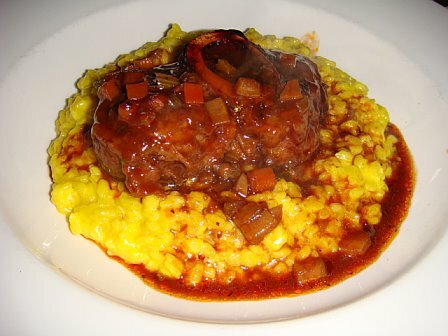 Veal osso bucco on saffron risotto with a red wine sauce. It was divine! 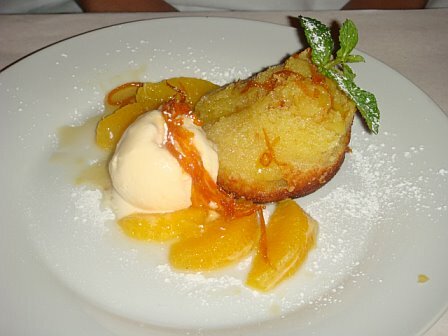 We were both too stuffed for dessert and called it a night after our main dishes. No special appearance by Ashton unfortunately but the night was still exciting! The place was bustling around 7 and I’m glad we got to take in and enjoy the restaurant before everyone got there as well as see what the crowd is like during it’s busy hours as well. This place would get four and a half stars out of five for sure! We went out for Billy’s 28th birthday this past weekend to The Village Idiot on Melrose. (Happy Birthday Billy!) We had a group of 7 and after waiting a good hour for a table (they don’t take reservations) we were finally seated. 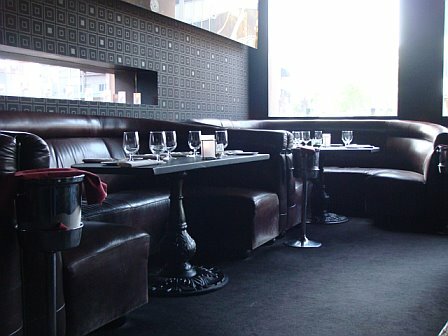 I liked the ambiance… it felt like more of a restaurant than a bar. And even though it was really loud, I had a good time at dinner! I’m sure that had more to do with our group than our actual dinner though. We started out with a few appetizers to share with everyone at the table. 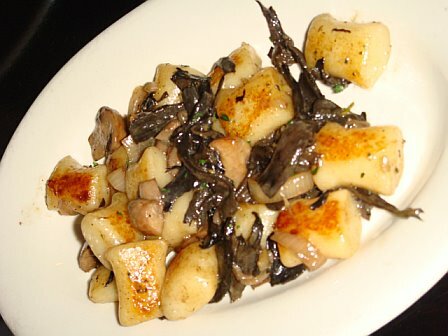 Boyfriend picked the house made potato gnocchi which was pretty impressive. I loved the mushroom flavor! 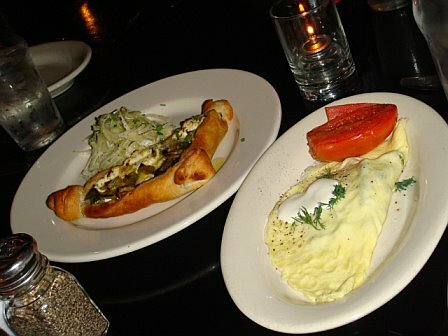 We also got a leek and goat cheese tart and an omelette with veggies in it. 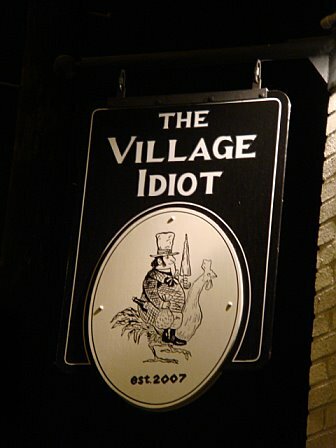 I had read online that The Village Idiot is known for it’s Pub Burger but I had just had a burger the night before so I wanted something else. 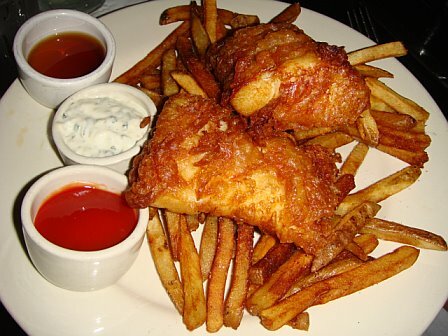 The server talked me into getting fish & chips because that is their other dish they are known for. 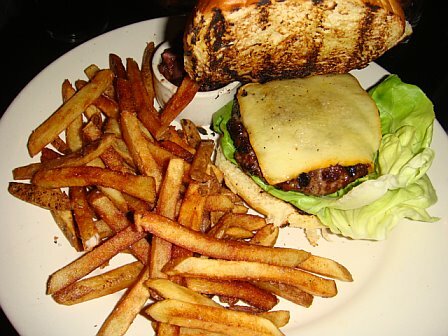 I can feel my arteries clogging just looking at this picture again. I picked out the fish meat and definitely didn’t eat all of the fries. Unfortunately, I wasn’t impressed with my dish. The tartar sauce tasted really odd for some reason so I ate my fish AND fries with ketchup. The Village Idiots were nice enough to recognize how patiently we waited for a table and brought out two desserts on the house. We got to try the Warm Bread Pudding with apricot Triple Sec sauce and pecan crumble along with Billy’s birthday chocolate chip cookie and scoop of vanilla gelato on the side. All in all, I’m glad I went (it was fun celebrating Billy’s birthday with him) but would probably not go out of my way to go again. 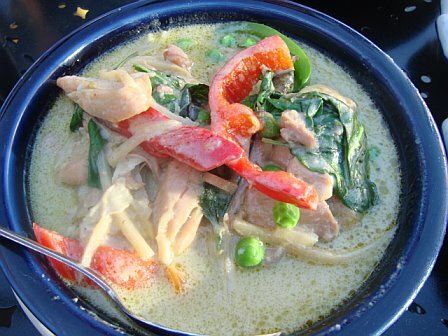 You are currently browsing the For the Love of Food weblog archives for April 2008.